If someone who is close to you is arrested and does not have the funds to post the amount of bail that has been decided by the judge, you might find yourself in quite the predicament. Seeing as how you are not currently locked up, it might fall on you to find the right Roanoke bondsman to help your loved one out of this sticky situation. However, how are you supposed to know which bail bond company you can trust and which ones are just trying to scam you out of some serious dough? In this post, we are going to offer some advice about what a bail bond actually is and how you can use this knowledge to pick bail bondsman who you can trust to work with. Also known as a surety bond, a bail bond is paid by someone known as a bail bondsman. This is essentially money being exchanged with the court that ensures that the Accused will show up for their court date. The amount of bail can vary depending on the severity of the crime that the person is being charged with. A bail bondsman basically acts as the surety for the accused person. In short, the bondsman is taking responsibility for the defendant and agreeing to take on the monetary penalty that will be passed down if said defendant does not show up for their court dates. This money must be paid to the court and represents a loss on everyone’s behalf who was involved in getting the person out of jail initially. The bondsman then has the ability to locate the defendant and recover the money that is owed to them. When the defendant is located, this will also lead to their subsequent arrest for “skipping bail.” Fortunately, this is not that common, and also not the reason bondsmen exist. The bondsman’s main objective is to help those get out of jail who do not have the means to pay their own bail. What Should You Look for in a Roanoke Bondsman? When you are trying to find the right bondsman for your specific situation, you should first only consider bail bond companies that are backed by the Better Business Bureau (BBB). Additionally, you should look for a bail bond company that is willing to be flexible and work with you depending on your financial situation. The best bail bondsmen know how the entire process works and should be able to explain it to you in terms that you understand. They will also make you feel comfortable, like you can trust them. If you get any uneasy feelings about the company you are considering working with, you may want to reconsider using them at all. The best bail bond companies know how to make this process easy and less stressful as they have been doing it for a while. Contact Affordable Bail Bonding Right Now! 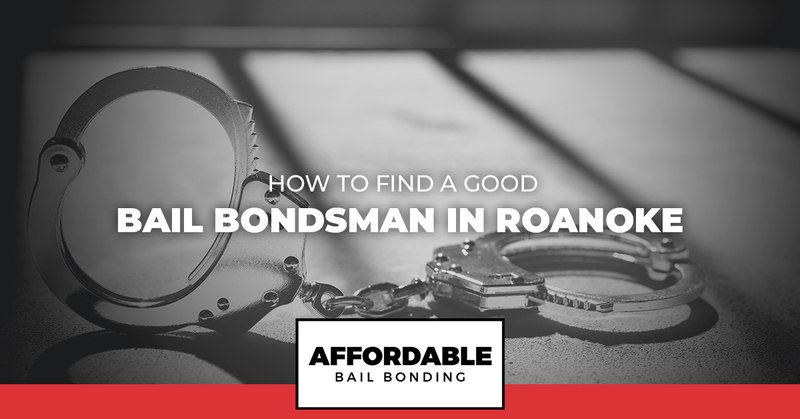 If you are in need of a bail bondsman to help you get a friend or family member released from jail, you can count on Affordable Bail Bonding in Roanoke. We know the bail bond process like the back of our hand and we will go above and beyond for you to make sure the process goes as smoothly as possible. Learn More About How We Can Help You Here!